In the 33rd episode of the podcast Leisa Schaim joins the show to talk about the recent History Channel episode on astrology, and discuss the pros and cons of the coverage of astrology in that show. During the course of the podcast we provide a synopsis of the History Channel episode, as well as a commentary of some of the things we thought were done well, as well as some critiques about things that could have been done better. The History Channel episode largely focused on the debate about whether astrology is a science, and in particular some of the common criticisms of astrology, and so we ended up discussing some of these issues extensively in our commentary. The episode was part of the History Channel series The Universe: Ancient Mysteries Solved, and it was episode 9 in season 7, titled “Predicting the Future.” It originally aired on May 16, 2015, although you can buy the episode and watch it online now for $2 on on YouTube or through Amazon instant video. Below you will find the synopsis of the episode that we wrote out and used as part of our show notes, followed by links to play or download this episode of the podcast. The episode opens by asking whether astrology is a science or just superstition. First 10 minutes or so is a quasi-history of astrology. Goes into the difference between astronomy and astrology. Gives various different definitions of astrology early on and throughout the show. Points out that astronomers were also astrologers early on. Mistakenly attributes the development of the zodiac to the Greeks in the 4th century. Talks a little bit about the origins of the zodiac. Talk about the use of astrology by powerful people in the past. The astronomers write this off as superstition. They talk about Kepler and his contributions to astronomy, and acknowledge his use of astrology, but write this off as just making pocket money off of superstitious patrons. Demonstration about how the constellations are stars that have no connection with each other. Only patterns from our vantage point. Talk about the revival of astrology and advent of Sun-sign horoscope columns in the 1930s. Segment on objections to Sun-sign astrology. They let the astrologers respond by pointing out the birth chart. They set up a test of astrology with the two astrologers being given a chart to interpret. Despite this the astronomers point out that there are no statistical studies validating astrology, and say that it is just guess work. Long segment on astrology and precession. Transition into section on the astrological mechanism, and whether there is any known force that could account for astrology. New section on whether there could be an unknown force. Segment where the scientists try to say that astrologers haven’t kept up with recent astronomical discoveries (which is hilariously absurd). Segment on scientific tests of astrology. Closing segment talking about the number of people who still believe that astrology is scientific despite the lack of evidence. 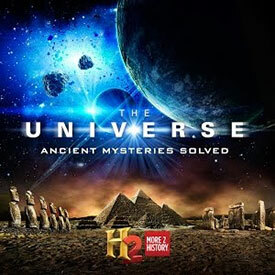 For the record, anyone who has a cable account that carries the History Channel can log in to http://www.history.com/shows/the-universe-ancient-mysteries-solved/videos (you choose your cable provider and log in through their site) and watch this for free. Oh, excellent, thanks for pointing that out! I appreciate it. Excellent summary and response to the show. I’m such a fan of the concise and organized nature of your shows, and laid back delivery. You do a great job of conveying information objectively, but lacking no conviction. Thank you! It’s not easy being an astrologer, but I think we should stop apologizing and seeking approval, although yes, there is still a lot of work ahead explaining what astrology really is and fighting misconceptions. It would be nice to go deep into this tropical/sidereal zodiac debate, because this thing keep coming. In France, sidereal astrologers are very hostile and claim to have the true zodiac and it brings a lot of confusion. Interesting regarding sidereal astrologers. I promise I am not hostile, : ) , but I do prefer sidereal also. After one year of going back and forth from tropical to sidereal, I finally decided on sidereal. My “AHA” moment was when I was using the ephemeris and it dawned on me that all the ephemeres I was using were (of course) sidereal. That settled it for me. What I now do is not even give the Sun sign to clients. I just give them the synthesis. Works so far. Tropical versus sidereal is not an easy topic (“I’m right, you are wrong and you are messing with my identity.”), so I don’t even know where to start, but thank you for being a peaceful sidereal astrologer ! We need that ! BTW, I must say that I admire the US astro community. You are doing a lot of researches and you are truly moving astrology forward. And I also like this mature/respectful attitude. In french countries, astrology is in a bad state, although I’m working hard on changing that. Last but not least, have a look at this video. Is the great pyramid of Giza an astrological clock that shows us the astrological ages ? I could not find any video attached. Sounded interesting. The astrology part starts at 1 hour 21 minutes 18 seconds. The show ends with this great flood myth, which is kind of too irrational for me, but I still think it’s interesting that the great pyramid could be linked to astrology. Well, I watched the whole video; I do enjoy programs about ancient civilizations. In answer to your question, I believe the Egyptians were fully aware of precession , but, at the time of the building of the Giza pyramid(s), I don’t think astrological ages were in the lexicon. I am sure they would have embraced the concept, based on their astronomical/astrological knowledge, but even their zodiac was a bit different than our current (Hellenistic) zodiac. I have a special fascination for the ancient Egyptian civilization, astrology, and religion. But, the more I read, the more I realize we have only scratched the surface in truly understanding their civilization. Comments? Did I answer your question?